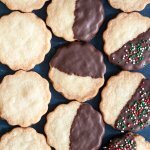 These Classic Shortbread Cookies can be served plain or covered in chocolate. Whichever way you decide to make them, they’re always a crowd favorite, because classic never goes out of style. And just like that, February is almost over. I swear I was just laboring away in the kitchen baking up batches of Christmas cookies not so long ago. I had so much left over Christmas sprinkles, I had to use them on something. And these Classic Shortbread Cookies drew the short straw. Sprinkles are completely optional on these but they’re kind of fun. 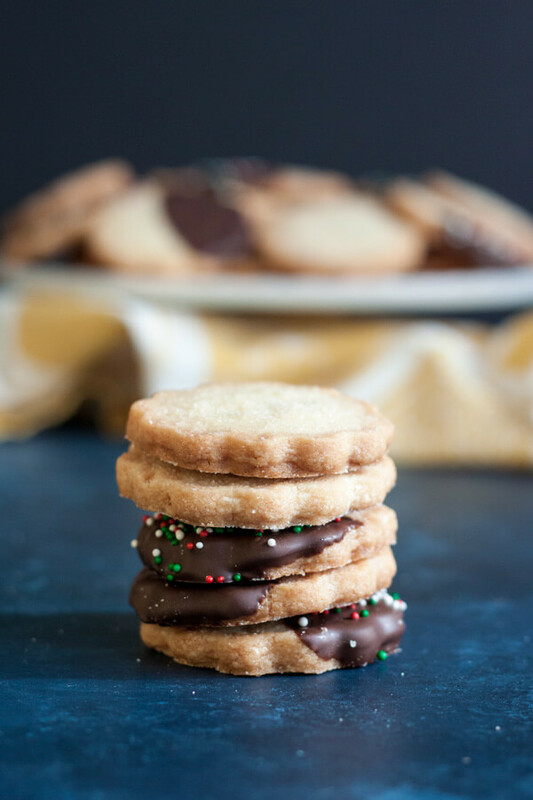 However, if you’re not into sprinkles or don’t have any on hand, by all means skip them since they do not make nor break these delicious buttery classic shortbread cookies. The amount of melting chocolate called for in the recipe will be enough to cover half the batch of cookies and up to 20 cookies. Variety is fun to have, but if you prefer to cover all of them with chocolate, just use more melting chocolate. I used dark chocolate melting wafer since dark chocolate is my favorite. However, feel free to use any kind you prefer, milk, semisweet, white chocolate. 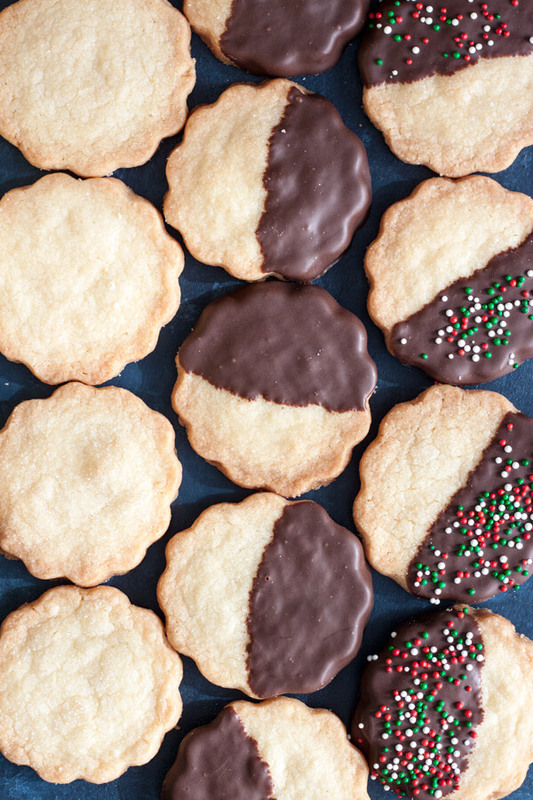 You shouldn’t need a reason to bake, especially when it comes to shortbread cookies. 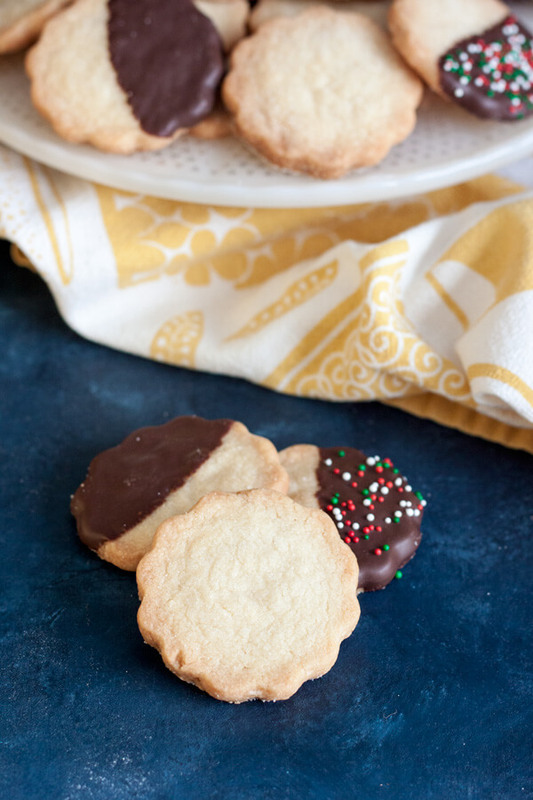 But if you do, how about we almost made it through February, let’s celebrate with some Classic Shortbread Cookies! Melt chocolate in a heat proof glass bowl over a small pot of simmering water over medium low heat, double boiler style. This should be enough to dress up to 20 cookies. Cover the cookies half way with melted chocolate by dipping them into the bowl or spooning the chocolate on, let the excess run off back into the bowl and place them back on the parchment line baking sheet to harden. If using sprinkles, add them as soon as you place the cookies on the baking sheet before the chocolate hardens. These are lovely! I love shortbread cookies, and these sound delicious! Cookies like yours are hit to me at any kind of party! Shortbread are my favorite. These are calling my name. Thanks Wendy, one of my favorites as well! These look so delicious. Shortbread cookies are the best! 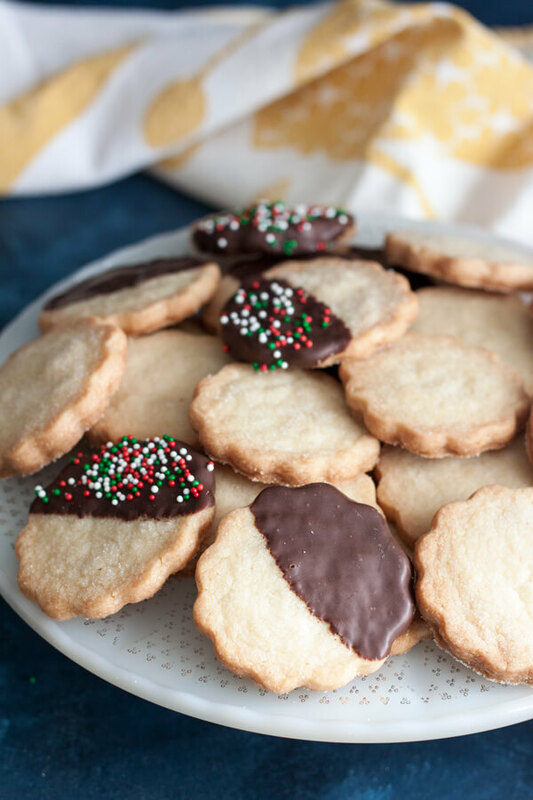 Classic shortbread cookies are my weakness! And sprinkles definitely make everything better!!! Sprinkles definitely make everything more fun! Such a delicious, beloved cookie! Dipping in chocolate makes them even more enticing!! !